Daily CEO Pay Now Exceeds U.S. Workers Annual Salary – Richard Smallteacher | कृति मेरे मन की……. U.S. corporate CEO salaries rose 16 percent in 2012 according to a new report from research firm Equilar. Top salary: Larry Ellison of Oracle – over $96 million. Top exit bonus: James Mulva of ConocoPhillips – $156 million. Average salary for the CEOs of the top 200 U.S. companies with revenue of over $1 billion was $5.3 million. The big money, however, is paid out in stock and options which added another $9 million to the median compensation package for the CEOs. Worst off were the workers at these companies whose median pay is now at a historic low compared to the CEOs. In 1965, according to a new report from the Economic Policy Institute, the average CEO made 20 times the average worker. 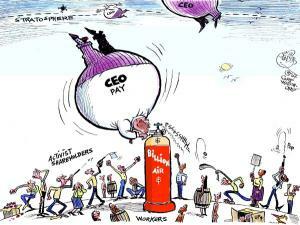 Now the ratio is 273 to 1 ie the average CEO’s daily salary is now greater than the annual salary of their workers. Ellison did even better – he was paid the equivalent of the average U.S. salary of $45,790 every single hour last year. “So much for the idea that shareholders were finally getting through to corporate boards on the topic of reining in pay,” writes Gretchen Morgenson at the New York Times. The salary survey was commissioned by her newspaper. And CEO’s sometimes do even better when they quit. Take for example, James Mulva of ConocoPhillips. He was paid $140.8 million in 2011 but topped that in 2012 when he left the company after 10 years as CEO. Once he cashed out his stock options, took his retirement bonus and got his final paycheck, he collected a whopping $260 million in 2012. The New York Times has a list of the rest of the top ten in departure bonanzas: Edward Breen was paid $46.2 million after leaving Tyco International, George Lindemann of Southern Union got $44.1 million, Kevin Sharer of Amgen was paid $40.4 million, Douglas Foshee of El Paso Corporation got $37.4 million, James Skinner of McDonald’s and Brian Duperreault of Marsh & McLennan were each paid $33 million, Michael Szymanczyk of Altria got $27.9 million, while John Chapman of Axis Capital Holdings made $26.5 million. Lynn Elsenhans of Sunoco was the only woman in the group with $23.6 million. Mulva may have made the most in 2012 but three CEOs would have received even more under their current contracts had they been let go, according to Bloomberg News. David Zaslav of Discovery Communications will get $224.7 million if he’s fired, Les Moonves of CBS will get $251.4 million and John Hammergren of McKesson Corporation tops the charts with a potential $303.4 million. Not all corporate titans did quite as well in 2012. Another Equilar survey conducted for the Financial Times shows that the top 15 bankers made an average of just $11.5 million down 10 percent on the previous year. Highest paid was John Stumpf of Wells Fargo who got $19.3 million followed by Jamie Dimon of JP Morgan who was paid $18.7 million.